A treehouse is a dream not just of children but of adults alike. Thoughts of lazy days while reading a book or sipping a cold beverage in a private, lofty paradise often fuel the motivation to pick out a tree and start building immediately. Enjoying a treehouse worry-free, though, is possible only when the treehouse is sturdy and secure. This open-air platform-style treehouse is safe, basic, and requires only one tree. Difficult and unfamiliar arboreal engineering is kept to a minimum because the weight of the platform is borne entirely by four posts sunk into the ground. Alternately, for a more classic treehouse look, half of the platform can be carried by two trees substituting for two posts. Save time by installing pre-built deck railing or save money by building the railing from scratch. 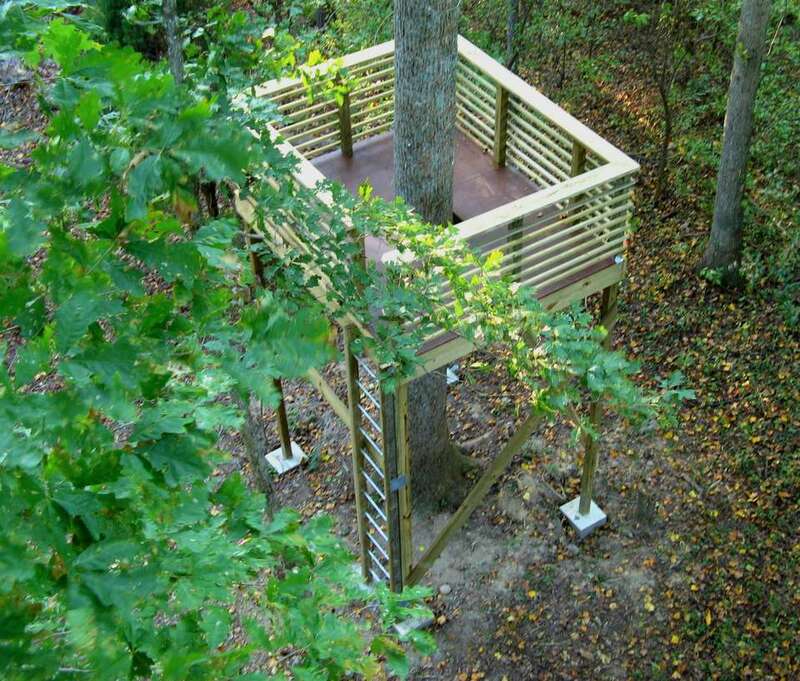 Some treehouses require unusual materials found only at specialty online treehouse supply stores. This treehouse, though, uses basic building materials, tools, and techniques. All materials can be found at your local home center. Due to their beauty and strength, deciduous hardwoods like oak, maple, beech, apple, and ash have long been used for building treehouses. Evergreens such as Douglas Fir, pine, spruce, and hemlock work well, too. Ensure that the tree is straight and as close to vertical as possible. Any lower branches should be trimmed away to the desired height of the platform, plus another 6 feet. To accommodate joists spaced 16 inches apart, it's best if you choose a tree diameter that stays within this size. Few building codes and zoning laws that establish standards for earth-bound structures apply to these tiny houses in the sky. After drawing out a complete plan for your treehouse, call your local permitting and zoning departments and set up personal appointments. Building permit departments are concerned with the safety of the structure itself, while zoning departments are interested in the placement of the structure on the property. Because significantly deep holes must be dug for the footers, call your local utilities avoidance hotline to make sure that you do not hit electric, sewer, water, or other vital service lines. Good-neighbor etiquette also means that you should speak to any neighbor whose adjacent property may be affected by the treehouse. Using the tree as the center point of the treehouse, mark four locations for the post footings in a square shape. Post footings will be 8 feet from each other and equidistant from the tree. Ensure that outer dimensions of this square measure 8 feet by 8 feet, not the on-center dimensions. This is vital because the inner dimensions of the floor frame you will create in a later step will be 8 feet by 8 feet; the posts and the frame must align. Mark these locations by pounding four wood stakes into the ground. With the post hole digger, dig four holes to a depth required for your area so that each post extends below the frost line. Check with your local building department for this information. Bed the bottom of each hole with 3 inches of gravel. Place a cardboard form tube in each hole and cut each form tube down so that about 2 inches of the tube extends above ground level. Mix the concrete, then fill each form tube until the concrete is level with the top of the tube. Smooth the concrete so that it is flat. With the concrete still wet, set a 5/8-inch diameter J-bolt into each concrete footing so that it extends 3/4-inch to 1-inch above the concrete. Install a post base to each of the four footers with the included washer and nut that attach to the embedded J-bolt. Set each six-by-six atop a post base, plumbing with a level and nailing into place with 16d nails. Secure with post temporarily by tacking two two-by-fours to each post to form a triangle brace whose two free arms rest on the ground. Using four two-by-tens, create a square that will form the outside perimeter (or rim joist) of the floor frame. The frame should be 8 feet long by 8 feet wide. Cut two of the two-by-tens so that each one is 7 feet, 9 inches long. The other two-by-tens remain 8 feet long. Nail the four boards together with 16d nails on end to form the square. With two helpers on ladders, have the helpers raise the floor frame above the level of the tops of the posts. The floor frame should now be wrapped around the four posts. Slide down the floor frame to the desired floor height. Temporarily tack the frame into place on each post with 16d nails. The nail heads should stay exposed for easier removal. With the cordless drill, make two pilot holes at each post through the two-by-ten frame and into the post. Follow up by screwing the lag bolts and washers into each pilot hole with a ratchet wrench. Remove the temporary 16d nails with the claw end of the hammer. Remove the temporary two-by-four braces as these will be used to create permanent cross braces. These can either be short knee braces that extend from one post to the floor frame or they can be longer diagonal braces that extend from one post to an adjacent post. To create knee braces, cut four of the two-by-fours in half so that you have eight two-by-fours that are each 48 inches long. Place a two-by-four in the desired position of the knee brace (45-degrees, extending from the rim joist to the post), then mark the cuts from the back with the pencil. Cut with the miter saw and test it out on the treehouse. If it works, use this as a template for cutting the remaining three knee braces. Drill pilot holes, then attach one knee brace per post with the 1/2-inch lag bolts. To avoid lag bolts from one brace interfering with lag bolts on a post's other brace, the second set of four knee braces should be cut either longer or shorter than the first set. Measure, mark, cut, and attach these braces as you did the other set. With the pencil and tape measure, measure twelve positions on the inside of the floor frame for the joist hangers. There should be six hangers on one side and six on the opposite side. Hangers should be 16 inches apart. You may have to slightly adjust the position of the middle two hangers to accommodate the tree. Nail the joist hangers into each position with the 10d nails. Firmly pocket the remaining two-by-tens into the joist hangers, then attach the boards and the hangers with 10d nails. To increase the joists' strength, double up the two sides of the frame that have the joist hangers with two more two-by-tens mounted on the outside of the frame. Nail into place with the 2 1/2-inch nails. The eleven remaining two-by-tens will be used as deck boards. Face-nail onto the joists with the 16d nails. Or for a cleaner look, consider purchasing a hidden fastener deck system, such as the Camo Marksman. Space boards 1/8-inch to 1/4-inch apart. When reaching the tree, cut these boards to length. Install the hand railing on the top of the deck following the manufacturer's instructions. Be sure to leave a section about 2 feet wide for access. As for a ladder, many rope ladders are available online that can be attached to the treehouse or tilt an extension ladder into place for a sturdier solution.